The National Weather Service In Shreveport Has Issued A * Severe Thunderstorm Warning For... Southwestern Jackson Parish In North Central Louisiana... Southeastern Red River Parish In Northwestern Louisiana... Natchitoches Parish In Northwestern Louisiana... Southeastern Bienville Parish In Northwestern Louisiana... ...Read More. 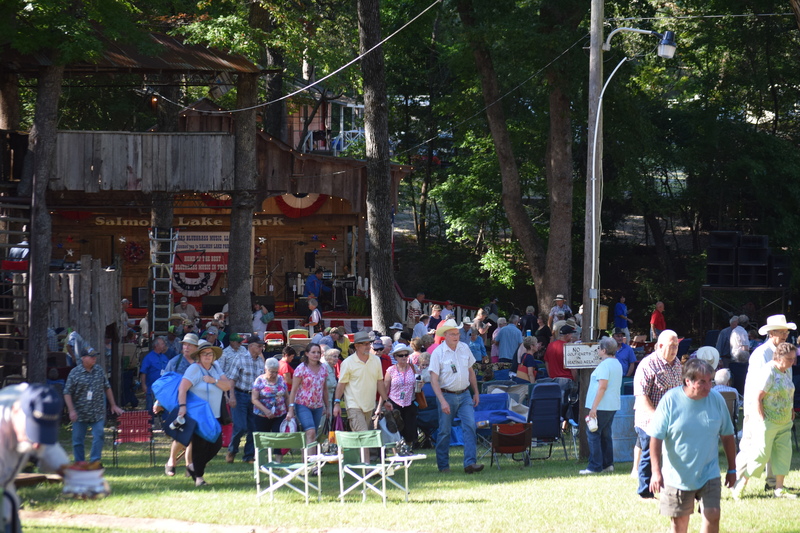 The crowd at the 40th Annual Bluegrass Festival takes a break for supper on Saturday evening. GRAPELAND – While the weather turned somewhat nasty on Labor Day, it held just long enough and was absolutely gorgeous during the 40th Annual Labor Day Weekend Bluegrass Festival. The yearly event began on Wednesday, Aug. 31 with a potluck dinner for all the early arrivals and officially kicked off in grand style the next day as Floyd and Fannie Salmon were showered with gifts, a proclamation from State Sen. Robert Nichols and a presentation of the key to the City of Grapeland from Mayor Balis Dailey and the Grapeland City Council. The Salmons were also serenaded with a song written in their honor and set to the theme from the Beverly Hillbillies. Following the opening festivities, the music cranked up Thursday evening as the Texas HoneyBees led off the festival and the sounds of Bluegrass music could be heard coming from Salmon Lake Park until late in the afternoon of Sunday, Sept. 4. After the festivities had drawn to a close, Festival Manager Collee Biller-Littlefield commented on the Labor Day weekend event. “I think it went very well. We had a lot of people who drove in from the local area for a day. I would say we probably had more drive-ins that we have had in long time. The park was pretty full and the seating area was packed. It was pretty nice to lout there and see all of the folks who had come in,” she said. Another band who was a big hit was the Salmon Family Band. “They played on Saturday night and they had only been practicing for about a week. Connie’s (Salmon-Norsworthy) son had just returned from the Marines. He plays the guitar and his wife is a very good singer and of course Connie has played for years and Carolyn (Salmon-Kazmierczak) picked up the mandolin and learned a few licks to get up on stage and then of course Floyd. They were backed by the Sabine River Bend Band and it was very, very god. They sang three songs, Floyd told a joke or two and did a little comedy skit. They carried him off the stage to get him to shut up, but it was all part of the act! It was cute, everyone liked it, they looked good and they sounded great. They have that family harmony,” the festival manager said. Regarding the Salmon family, Biller-Littlefield said both Floyd and Fannie were thrilled with the 40th Anniversary celebration. “They haven’t had a chance to go through all stuff people brought for them. They plan on doing that today (Monday), but everyone’s been kind of busy,” she laughed. “They were quite pleased with the proclamation from Sen. Nichols and what it had to say. Of course, the City of Grapeland gave them keys to the city and Floyd is still trying to figure out what key goes where! They were quite surprised and pleased.” she said.